The poets singers and saints with their passionate devotion to the ideals of beauty harmony, freedom and aspiration have had the strongest impact on society. We have had a few great spirits in the last century who emphasized the ideals of the race and demonstrated their vitality and power of survival and one of the most notable of these saint singers was Tyagaraja. The spiritual Heritage of Tyaga-raja was prepared jointly by the late C. Ramanujachariar and Prof. V. Raghavan of the Madras University. Prof. Raghavan in his preface to the work described the varied qualities of the late Sri C. Ramanujachariar who was a bhagavata in every sense of that term. The introductory thesis written by Prof. Raghavan shows his vast and varied learning and devout enthusiasm for Tyaga-raja. This learned and scholarly work is bound to extend the influence of Tyaga raja on the minds and hearts of our people. In the present condition of the world which may blow up at any moment if we are not careful and restrained in our international behavior it is necessary for us to rethink our fundamental ideas. The problem of the world is not a political one which can be answered by statesman with their pacts and alliances. Our law and polities our arts and sciences our manners and morals makes derived from our fundamental faith. It is the faith which makes for the spiritual unity of any community. It is our faith that will save or destroy us. The decline of faith has for its natural accompaniment decadence of culture. Gibbon writers the Greeks after their country had been reduce into a province imputed the trumps of Rome not to the merit but to the fortune of the republic. The inconstant goddess who so blindly distributes and resumes her favors had now consented to resign her wings to descend from her globe and to fix her firm and immutable throne on the banks of the Tiber polybius deprived the Greeks of this delusive comfort and traced the greatness of romes to her moral qualities Gibbon adds honor as well as virtue was the principle of the republic according to Polyps the Romans were incapable of fear and impatient of repose Gibbon says that the declines of greatness prosperity ripened the principle of decay and the causes of destruction multiplied with the extent of the conquest when Rome fell her downfall was attributed to the spread of barbarism and Christianity. Three is a moral law which governs the rise and fall of nations. Adherence to the moral law the law of dharma elevates a nation non adherence to it degrades it. If we are to progress we must adopt the path of virtue. We have had in our country from the time of the Rg Veda down to our own days a long line of torch bearers who stress the primacy of spiritual values who point out that even as the human being is above the animal the spiritual man is above the human. We are not yet we hope to be. At a time like this when we are faced with conflicting ideologies national dissensions and international intrigues it is good to be reminded of the supreme values of knowledge discipline and devotion. The exponents of pure abstract speculation find their way into the minds of men through passionate devotion to the ideals of beauty, harmony; freedom and aspiration have had the strongest impact on society. We have had a few great spirits in the last century who emphasized the ideals of the race and demonstrated their vitality and power of survival and one of the most notable of these saint singers was Tyaga raja. The name Tyaga raja means the prince of renounces of those who give up worldly desires. Tyaga or renunciation is the way to mental peace and freedom. So long as we are incapable of withstanding the snares of fear greed ambition vanity we will have disquiet in our minds and violence in the world. In one of his songs tera tiyagarada Tyaga raja says O Supreme Being Tirupati Venkataramana could you not remove the screen of pride and envy which is taking a firm stand within me keeping me out of the reach of dharma and the like. In the case of Tyaga raja renunciation is the result of undistracted devotion to god. Anuragat viragah. Bhakti or devotion to the supreme leads to renunciation and concentration on the divine. The attainment of life in god is achieved more easily by Bhakti says Ramanuja snsha purvam anu dhyanam bhaktir ityobhidhiyate. The soul of man is the stage for triumph and defeat suffering and joy. It is the point of intersection between the divine and the human. Each human being has his roots here below though he is also a reflection of the celestial light. The demand for self realization through self renewal is an appeal from the creature to the creator in us. As a creature each one of us is given to inertia staleness distractedness. It is the corrupt state of narrow selfishness. The creative spark in us gives us the power of reintegration renewal. Until the conflict is resolved and reconciliation affected the soul passes through moods of self pity anger distraction devotion. In the unregenerate condition it feels estranged from itself from others form the creative ground of all being. Tyaga raja describes the moods of the soul with great delicacy of feeling. He describes social splendor as well as abject misery. This publication entitled the spiritual heritage of Tyagaraja is the result of an idea conceived and pursued for many years with devoted zeal by Sri C. Ramanujachari. Administrator actor musician and public worker the late Ramanuhachariar was primarily a sadhaka who strove on the spiritual path not only through his tireless karma yoga in the cause of the Ramakrishna movement and the education and upbringing of the young but through the path of Bhakti and bhajana he was a bhagavata is every sense of that terms and it is this fact which gave meaning to the dedicated life that he led to the last minute of his existence. The wide public knew Ramanuhachariar as the secretary of the Ramakrishna Mission students home his contribution as an actor alike to the growth of the amateur Tamil stage and the funds of the Ramakrishna students home was also known to many perhaps it is only those more closely connected with him that knew the musical side of his personality and the part he played in promoting the study of Carnatic music as a University subject. He was not only deeply devoted to this art but was very early drawn to the time honored way of cultivating it as aid to devotion bhajana for many years he was responsible for the organization and maintenance of the bhajana goshti that went round the kapali temple and tank in Maylapore every day at the break of dawn during the month of Margasirsha. It was in connection with the conduct of this bhajana goshti in Mylapore that Ramanuhachariar came in contact with the Umayalpuram brothers’ sundara Bhagavatar the director disciples of Tyagaraja. During his association with these disciples of Tyagaraja and their own pupils and descendents Ramanujachariar learnt a considerable number of the songs of Tyagaraja and developed a passion for them. In the subsequent years in which his musical activities widened he was seized with a desire to collect the texts or as many songs of Tyagaraja as were known to different musicians repositories of musical traditions and representative of the different schools of Tyagaraja’s own disciples. The musical appeal of Tyagaraja was well known as compositions embodying the trials and yearnings the religious fervor and devotional experience of one of the greatest saints and devotees the songs of Tyagaraja Ramanujachariar rightly scholars and devotees outside the part of the country forming the provenance of Carnatic music. He therefore proposed to prepare English renderings of the songs and for this took the help of the late Sri V. Krishna Rao retired government Telugu translator Sri V. Krishna Rao was assisted in the translation by his nephew Sri. T.L. Narasimha Rao sangita Kalanidhi T.V. Subba Rao was also consulted by them in the course of their work of translation. In 1946 the centenary of the passing away of Tyagaraja was being celebrated all over the country and music institutions especially in south Indian were making special preparation for the occasion. The Madras music academy had resolved to dedicate its annual conference in the December of that year exclusively to Tyagaraja and his music and as the secretary of the academy connected with its academic and literary work I was planning and a series of papers and studies on the different aspects of the life music and contribution of Tyagaraja with my own literary and cultural interests I was studying the songs of the composer on the background of the great music devotional movements that deepened the life of the Chola desa and Kaveri delta in the 17th 18th and 19th century. It was a this juncture that along with Krishna Rao Ramanujachariar brought to me a number of small volumes containing type copies of English renderings of the songs of Tyagaraja and proposed that I must sit with them and go through the songs in their English versions one by one and in the same compelling way in which he used to enlist support to his students home he demanded of me two things a schemes to analyze and classify the songs so as to bring out their varied contents in proverb perspective and an introductory thesis expounding the meaning and message of these songs. Without a break we sat together day after day for some months it was a regular spiritual sattra for us. In the course of the work translation were revised and additional songs and noted from all available sources printed texts manuscripts and representatives of different schools and traditions. In the Tyagaraja centenary conference of the Madras Music academy December 1946 Ramanujachariar made the first public announcement of the nature and scope of the proposed work. Tyagaraja was both a devotee and an artist the combination of Vedanta devotion and literary treatment in his songs naturally reminded one of the Bhagavata Purana and the Religio-aesthetic approach that Bopadeva and Madhusudana Sarasvati gave. Following them I adopted a synthetic scheme of the Vedantic Bhakti Sastra and the Rasa or Alankara Sastra for analyzing and studying the outpourings of Tyagaraja with this approach I presented my study of the contribution of Tyagaraja as a series of nine lectures which I delivered at Ramanujachariar’s instance during the nine days of the Navarati festival of 1947 at the Ramakrishna student’s Home. These lectures were published serially in the Vedanta kesari Madras and were well received subsequently I collected a good deal of additional material and revised and amplified my study for the purpose of the present book. 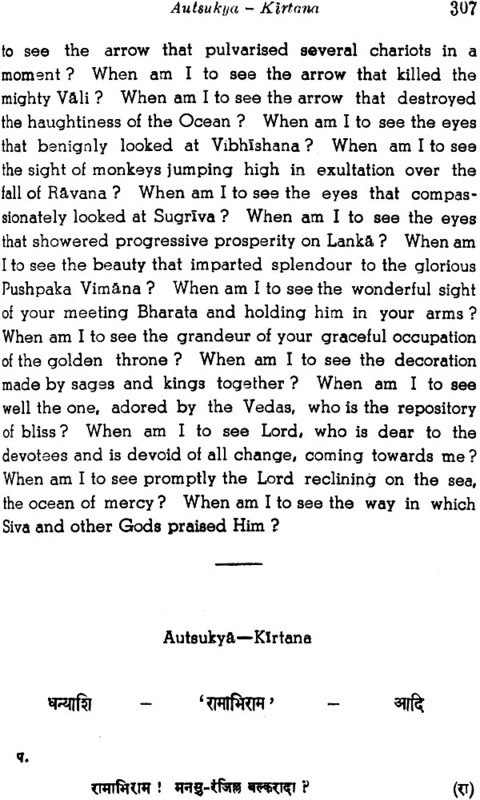 When the text of the songs and their English renderings were taken up for printing I decided that from the point of view of the all India public which the publication was intended to server the text of the songs should be in Devanagri script in addition to some compositions which are purely in Sanskrit there are numerous songs in which the Telugu diction is dominated by Sanskrit and even in the other remaining pieces there is considerable amount of sanskritic expression the Devanagri version of these songs would therefore help their being understood more easily by those whose mother tongue is not Telugu. Besides I am one of those who hold the view that the most significant classics in the different regional literatures particularly of the south should be brought out in Devanagri script.